Immigration reform is likely to be in the national spotlight early next year, as the Obama administration and Congress seek to fix a system that is widely viewed as broken. The people at the center of the debate — some who have been living and working in the U.S. without legal permission for years — are increasingly making their voices heard. 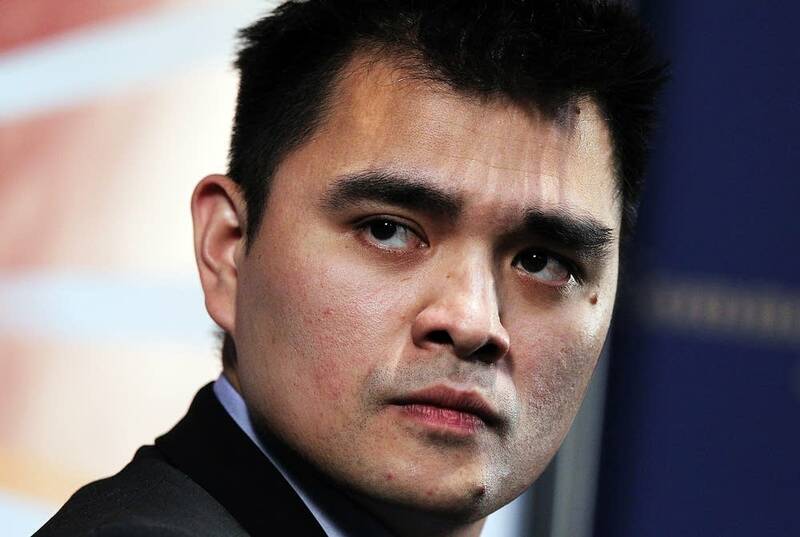 One who is widely known is Jose Antonio Vargas, a former journalist who will be speaking at an event in Minneapolis tonight. Vargas helped win a Pulitzer prize for the Washington Post's coverage of the Virginia Tech shootings, but his best-known story might be the one that ran last year in the New York Times: "My Life as an Undocumented Immigrant." Vargas came to the U.S. from the Philippines when he was 12 to live with his grandparents in California. When he was 16, he tried to get his driver's license and found out his green card was fake.Fourteen years later, with The New York Times piece, he stepped off the fast track in journalism, and into one of America's most contentious stories. "In some ways what I've been doing in the past year and a half now is reporting the biggest journalistic story of my career," Vargas said. "It just happens to personally involve me." Despite the fact that Vargas revealed his status in a most public way, Immigration and Customs Enforcement never came for him. Vargas' first brush with ICE came on a trip to Minnesota two months ago when he was pulled over as he drove to give a speech at Carlton College. ICE did not detain him. His attorney told The New York Times Vargas didn't fit any of ICE's priority categories for detention. The Obama administration has been criticized by some conservatives, including Supreme Court Justice Antonin Scalia, for what they describe as selective enforcement of immigration laws. Vargas now travels the country, speaking and inviting others to share their stories for his project Define American.In June, he wrote a piece for Time Magazine. 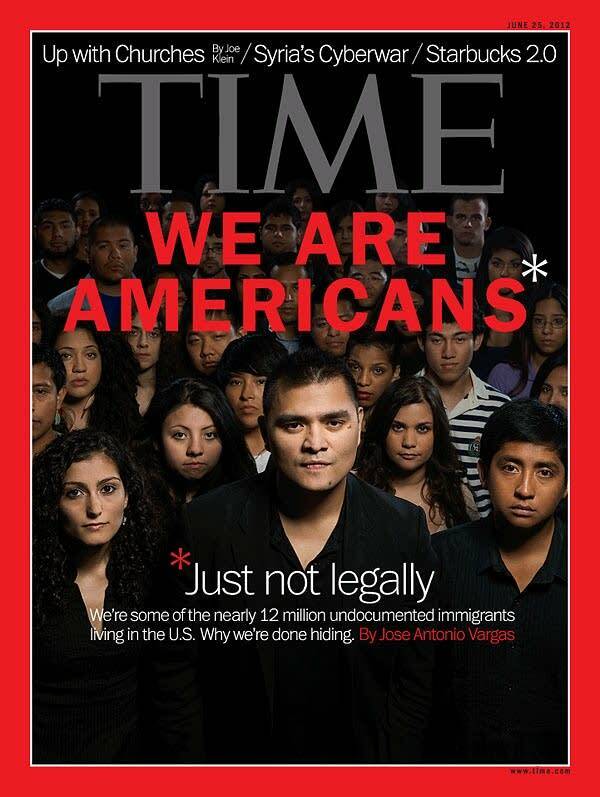 The cover shows him standing with other young immigrants from around the globe, the headline underneath reads, "We are Americans,* just not legally." "You have 36 undocumented people on the cover, you know, with their faces, their names, and their stories saying again, I'm not who you think you are, and this is not what you think it is," Vargas said. In Time Magazine's online vote for "Person of the Year," the contestant called "Undocumented American" is now running third. But Vargas also faults the media for oversimplifying the debate about immigration to a story about the Mexican border. He finds himself having to educate people about how the immigration system works and why fixing one's status is not so easy. "Illegal immigration is quite possibly the most controversial yet least understood issue in America. People just simply don't know how the immigration process works," Vargas said. "Politicians can say people like me should go to the back of line without expanding on, wait a second, where's the line and what's the process? There isn't one." Fixing that process will likely be the job of Congress next year. As chairman of the House Education and the Workforce Committee, Minnesota Rep. John Kline, R-Dist. 2, will undoubtedly have a voice in shaping new policy on immigration. Kline was not available for an interview, but on his campaign website where immigration is mentioned, he advised, "Among the highest priorities for any bill Congress passes is an outright rejection of any form of amnesty for illegal immigrants." Vargas is four months too old to qualify for the Obama administration's recently announced "Deferred Action" that allows some young people with good records who were brought to the U.S. as children to avoid deportation for two years. Vargas speaks tonight at the Riverview Theater in Minneapolis at a fundraiser for the Immigrant Law Center of Minnesota.